Our approach to catching salmon in Scottish rivers, our salmon fishing tactics, will be dictated largely by the state of the river, particularly its height, colour and temperature, and by the prevailing weather conditions. Such variables, in Scotland as elsewhere, will, in turn, be governed by the seasons. Tackle, tactics and flies for the colder "spring" months here in Scotland, and again at the back end of the season, might be very different from those likely to bring success at the height of summer, when the unfortunate salmon fisher might be faced with a shrunken river under a blazing sun, when he will rise early and go to bed late praying for the miracle of heavy overnight rain to bring fresh fish into his beat. Tactics, tackle and, to an extent, flies, for use on Scotland's salmon rivers, will also depend on the size and nature of the river. 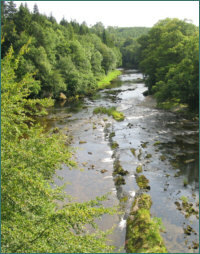 In February, on the wide reaches of the lower Tay or Tweed, fly rods in excess of fifteen feet will be the norm, used, sometimes from a boat, in conjunction with sinking lines and large flies. The smaller northern Scottish rivers might be tackled with something rather more modest, although here too sinking lines and large flies are likely to be the standard choice. 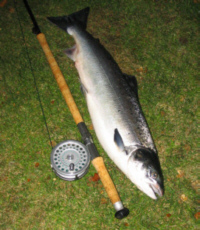 In early spring, and at times throughout the season, particularly in high and coloured water, many salmon anglers will take up the spinning rod, in combination with Devon minnows or Tobies, or the more recent Flying C lures or Rapala type plugs, all of which can, on their day, be very effective, and the more comfortable option in really wild conditions. Others, increasingly, will prefer to stick with the fly rod, even on the largest rivers. Early and late in the season, these will be long and powerful, capable of punching out heavy lines and large tube flies, perhaps in aluminium, stainless steel, copper or brass, or maybe Waddingtons in sizes up to three inches in length, in the most adverse conditions. In typical summer conditions of lower water, rod size and weight will generally be reduced, allowing a more delicate approach, with light floating lines, sometimes cast with single handed rods, long fine leaders and small flies of anything down to about size 14 being the order of the day. In good conditions, when the hoped for rain arrives and the rivers swell in summer spate, the longer rods might again be called into action, on the larger eastward flowing rivers at any rate, while on the smaller spate streams of the north and west of Scotland a single hander, or perhaps a short double hander of twelve or thirteen feet might be the weapon of choice. 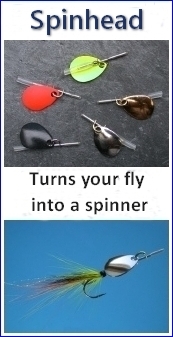 Floating or intermediate lines, used perhaps in conjunction with varying lengths and densities of sinking tips, are popular for summer fishing, with generally small single, double and treble hooked flies, often now of the long-tailed shrimp type, or maybe small plastic, aluminium, or the recently developed Needle Tubes Flies from Grays of Kilsyth. 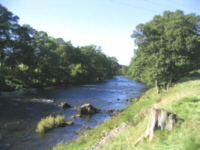 On many of Scotland's salmon rivers, given reasonable water, a run of grilse will provide excellent sport through the summer months but, on the majority of Scottish salmon rivers, the main salmon runs now come in the last two months of the season, September and October on most rivers, while the season is extended, on the Tweed and Nith until the end of November, and on the Annan to mid November, to allow fishing for the late salmon runs which occur on these rivers. Summer tactics will often continue into the early autumn months of September and early October, particularly if the weather is kind. On the smaller rivers, single handed rods might be used right to the end of the season, usually October 31st, while the long rods will again be pressed into service on the many medium and large rivers. 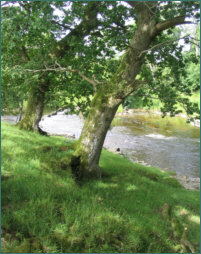 A whole range of salmon flies will be employed, depending largely on the prevailing conditions of water height and temperature.